Resistance was futile, I gave in and had to make a Dresden Circle for my Bloomsbury Quilt to see what they would look like. I love it and am wanting to make the rest up straight away. However all the other pieces have been stitched and are packed away ready for turning into blades on my sewing day in Matangi on Sunday. This is the smaller one for the centre of the quilt. So, I might have started another quilt. 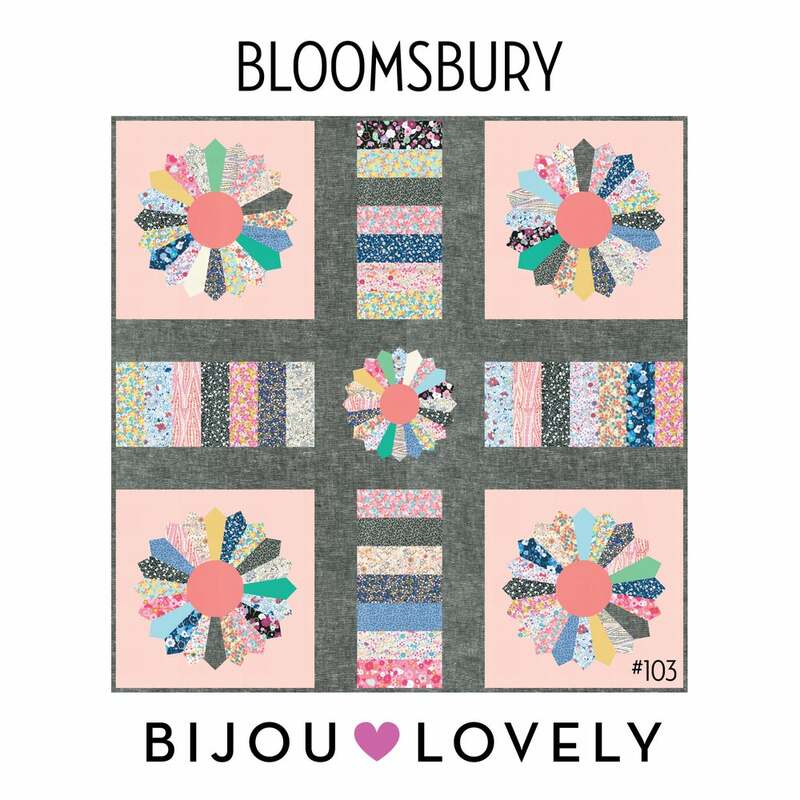 The other day while wasting time perusing the internet I came across this quilt, by Holly DeGroot of Bijoux Lovely. I pinned it, then kept thinking that it would be a lovely pattern to use my precious liberty fabrics in, if I was brave enough to cut into them. Friday night I purchased the pattern (gosh instant PDF downloadable patterns are fabulous), Sunday night saw me cutting Dresden pieces and strips of Liberty. Monday morning, I was still cutting Dresden pieces, resulting in so many pretty scraps of Liberty. I haven't decided whether to keep them or be ruthless and throw them out, realistically I know I will probably never use them. I can also see the advantage in having a rotating cutting mat when having to cut lots of template pieces. Monday afternoon, I started sewing the Dresden pieces, what was supposed to be a lovely quiet time on my machine, turned into a small grump fest, the fabric kept puckering and wouldn't feed through my machine. I was beginning to worry that I may have to hand sew them. After changing the needles, re-threading my machine, I resorted to getting out my sewing machine manual, it recommended cleaning out all the lint from the feed. Wow, did that make a difference. So now I have only 70 or so more Dresdens to stitch, turn out the right way, press and then stitch into circles. That should keep me out of trouble these holidays. This weekend Spring has finally arrived, gorgeous warm weather means I have been starting to get my gardens ready for planting. All the lovely blooms above were seen on my Sunday afternoon walk. Now it is on to planning my Q4 finishes. After working on Saturday, then racing around getting baking done, and dinner prepared for Sunday, I decided to have a little play with all my scrappy sampler quilt blocks - using a much wider piece of batting as a design wall. Overall I am happy with how it is looking, there are a couple of blocks that may not get used, and I think I need to make a couple more blocks in lighter brighter shades, then the fun can start with piecing it together. Sunday morning saw me driving down to Matangi for another sewing day. It is such a nice time of year for a drive in the country, seeing all the lambs, blossoms and new growth on the previously bare trees. I had my Christmas place mats to finish binding, some felt Christmas decorations to embroider and my hand pieced cart wheel pillow. As usual, not a lot got achieved, however I did finish the binding, so that is another WIP completed for my Q3 Finish-Along Goalss. No birthdays this time, but still the usual good food, drinks, books and projects to browse at and great company. Angus the cat made it very difficult for me to pack up and leave, after deciding my bag made a great sleeping mat. There hasn't been a lot of sewing from me lately, as I have had a bit of work, but school finishes at the end of this coming week, so I am looking forward to two relaxing weeks at home, hopefully I can sew, get the garden ready for planting and work my way through my book pile. The patterns have been traced, now I just need to work out what fabric will go where, cut out the pieces and start sewing. The SWAK envelope quilt has been finished - finally it is quilted, bound - completed!! Last year a group of about 20 sewers joined a swap on Flickr. Using the pattern from the book Patchwork, Please, each month we had to paper piece 1 or 2 envelopes for the people allocated to that specific month, in the theme they requested. My theme was for bohemian inspired ,bright jewel toned envelopes with a fussy cut floral. I certainly think all the participants in this group met my criteria. When I had received them all, I put them in a box and put it away, unsure as to what I wanted to do with them. This year I decided that I had to at least get a quilt top made from them. I did that and have since gone even further and made a small quilt. Measuring just 48" square, it is backed in a linen like upholstery fabric, which is very soft, and has the added benefit of being very wide, quilted in the shape of the envelope flap and bound in with a fabric from Tula Pink's Moonshine collection. I am especially pleased that I managed to keep the row of envelopes on the back, aligned with the corresponding row on the front. This special quilt will be kept and used in my sewing room as a memento of the fabulous people I have met through the online quilting world. Thanks to all the SWAK swap girls. New low volume fabrics - this is a selection of Moda's Modern Basics. Hot chocolate, homemade fudge cake and a beautiful book - the perfect way to unwind on a wet day after work. After much dithering over how to quilt this, I had a brainwave and used the template which I used to fussy cut fabric for the envelope flaps as the pattern for my quilting. I never pick an easy option though, so there is much wrestling and stuffing of fabric through the small throat space on my machine, to make this design. (It always starts rolled up for manoeuvrability - but never stays that way). I had plans to get the quilting finished today, but was called into work instead, so I am working on completing a few sections each night, with the aim of having the binding attached ready to sew down by hand at my next sewing day.